When technology, engineering and inspiration come together, they create something outstanding. In fact, the resulting product can exceed expectations and overcome scepticism. Nobody thought that an SUV could combine the virtues of a practical, spacious vehicle and ignite the senses like a sports car at the same time. Yet the new Porsche Macan, infused with the spirit of the legendary 911, has delivered just that. 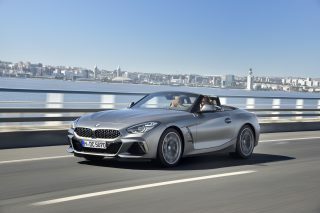 It has set new benchmarks in driving dynamics, design, and driving pleasure. Now this paradigm-defining engineering paragon has been updated to continue redefining its genre. Take, for example, the new powertrains that launch the sporty Macan and the blistering Macan S from rest to 100 km/h in 6.5 seconds and 5.1 seconds respectively with Sport Chrono Package. The beating heart of the Macan S is a new 3-litre V6 that delivers 354 hp and a top speed of 254 km/h. Its twin-scroll turbocharger is mounted centrally in the “V”, shortening exhaust gas paths and delivering swift responses. Optimising the combustion chamber geometry and enabling up to three injections per working cycle have yielded yet more performance and efficiency. Meanwhile, the turbocharged 2-litre engine capable of 252 hp in the Macan is equipped with VarioCam Plus, which continuously adjusts the intake and exhaust camshafts. Given enough road, the Macan will hit a top speed of 227 km/h. Porsche models are known for outshining the competition in driving dynamics. The Macan’s chassis engineers have examined every component for further optimisation, thus enabling the new Macan to once again raise benchmarks. The Macan’s revamped chassis ensures a more neutral handling response without compromising stability while improving overall comfort. 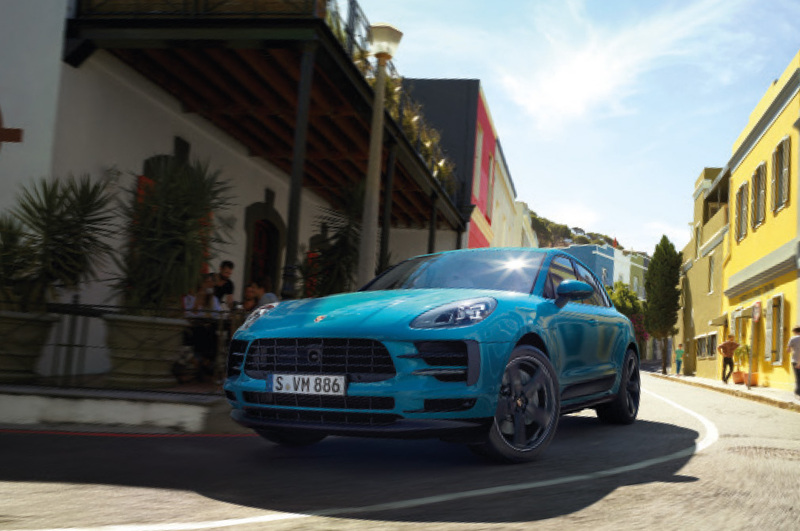 Both the anti-roll bars and engine mounts have been improved, while the Macan range is now equipped with next-generation mixed tyres as standard. These are but some of the changes that make the best compact SUV even better. 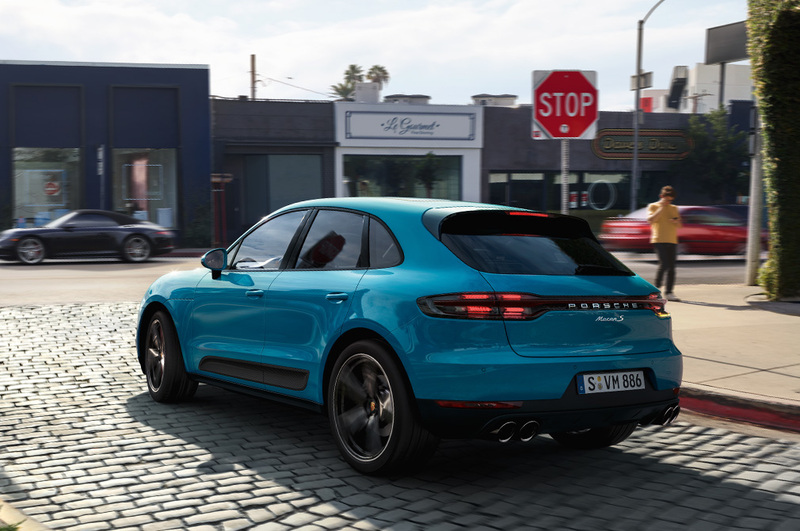 There is no mistaking this car for anything but a Porsche: the Macan’s updated exterior design confidently displays its resemblance and relationship to Porsche’s range of sports cars. A new three-dimensional tail-light strip with integrated “PORSCHE” lettering adorns the car’s muscular rear, while standard LED headlights with four-point daytime running lights sit atop large central and side intakes. Inside, drivers will find a new and even more attractive Porsche Communication Management (PCM) system, which has a larger 10.9-inch screen and full-HD resolution. There’s a multi-function sports steering wheel with paddle shifters for even better control and enhanced driveability. The central analogue rev counter stays in the driver’s sightline, while the car’s unmistakable Porsche DNA, along with the driving rewards it delivers, continues in unwavering fashion. Compact SUVs have no right to be this good to drive. Yet here we are, compelled. Heart beating, eyes wide, and with a huge smile on your face, your varied, thrilling lifestyle will know no better companion than the latest Porsche Macan models. Find out more at Porsche Centre Singapore!